More Than This: The 'Complete' Roxy Music Ed Ward connects the dots of the British band's eight studio albums, which were just collected in a box set. Roxy Music's eight studio albums are now collected in one box set, titled The Complete Studio Recordings 1972-1982. Roxy Music's eight studio albums have just been collected in one box set, titled The Complete Studio Recordings 1972-1982. Roxy Music is the only band I can think of that had an oboe player in it, and that's because the oboe player, Andy MacKay, knew the manager of another band, King Crimson. An unemployed ceramics teacher, Bryan Ferry, had auditioned for lead vocalist with them, and although he hadn't been selected, the manager thought MacKay should meet him. As it happened, Ferry had been fired from his teaching job for singing in the classroom — songs he'd written — and MacKay liked them enough to call his friend Brian Eno, who played keyboards and loved to mess around with electronic equipment. They made a demo tape. The demo got them some gigs, and they added more musicians, including guitarist Phil Manzanera. In mid-1972, they signed with King Crimson's label, E.G., and in August released their first, self-titled album. The British press went wild. They then put out a single that wasn't on the album. The British public went wild. "Virginia Plain" was a brilliant single, three minutes of shifting textures and a driving beat, with space for Eno's twiddling and Manzanera's avant-guitar playing. But although the band members closed 1972 with an American tour, they were largely ignored there and came home to work on another album, For Your Pleasure. The cover photo showed a neon-lit urban landscape in front of which a woman in a tight black dress and spike heels walked a snarling black panther, while off to one side her limo waited, chauffeured by a grinning Bryan Ferry. It gave a hint of what was inside. Not only did the album have the hit "Do the Strand," but it also had loads of mysterious lyrics against an increasingly confident backup. It also didn't hurt that one of the songs, "In Every Dream Home a Heartache," was a love song to a rubber doll deflating in a swimming pool. By this time, Brian Eno wanted out, and one day the band showed up for rehearsal and found out he'd hired violinist/keyboard player Eddie Jobson away from the band Curved Air to take his place. As it turned out, Jobson was a brilliant choice, and he added significantly to the next album, Stranded. The band was working hard to keep up its momentum, even though Ferry had released his first solo album, consisting of cover versions and a few originals, in 1973. The next year saw two Roxy albums, Stranded and Country Life, the latter of which had to be sold with opaque green shrink-wrap in the U.S. because of its cover photo, showing two women in revealing underwear standing in front of some bushes. And in 1975, with Ferry's solo career still going strong, the band released Siren, which featured his girlfriend, Texas model Jerry Hall, as a blue-tinted mermaid on the cover, and one of the band's most famous tracks as the lead-off: "Love Is the Drug." 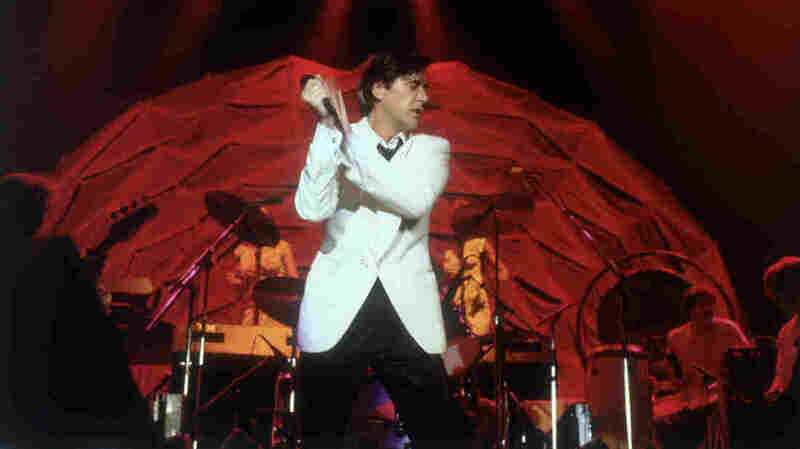 At long last, Roxy Music had conquered the U.S. charts with a song, but the band was exhausted, and in June 1976, its members announced they were breaking up, at least for a while. It turned out to be quite a while, but in 1979, a new Roxy Music album appeared. Manifesto had a crowded disco scene on its cover, but the dancers seem to be mostly mannequins. The lack of human feeling carried over to the contents, although the song "Dance Away" charted in both Britain and America. Undaunted, they were back a year later with Flesh + Blood, whose cover showing three blonde girls clad in white togas tossing javelins was as much of a change as what was inside, which included two oldies and a lovely pop tune, "Oh Yeah." But there was still stress: Ferry collapsed on tour and had to be hospitalized. 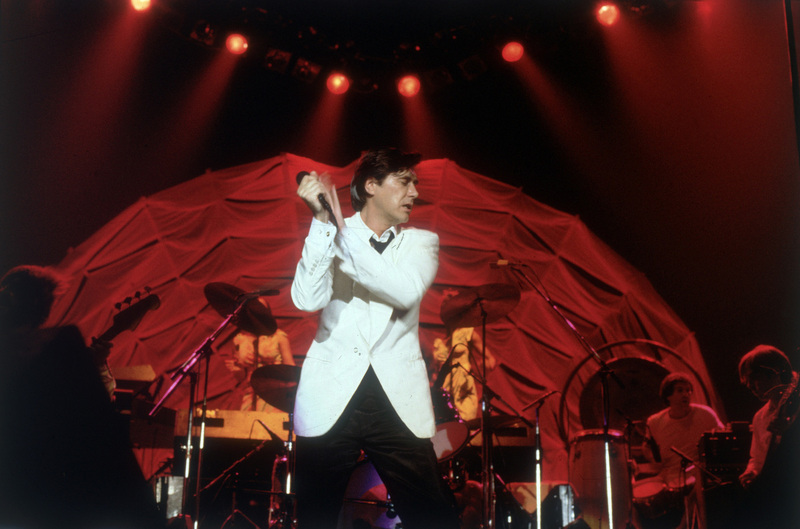 Nothing more was heard from Roxy Music until the spring of 1981, when Ferry led the band in a moving tribute to John Lennon. No album followed immediately, but a year later, Roxy Music called it a day with Avalon, which led off with a lovely single, "More Than This," but was otherwise devoid of ideas. Ferry has continued to record as a solo artist, and many Roxy alumni — including, of course, Brian Eno — have gone on to make plenty of wonderful music.